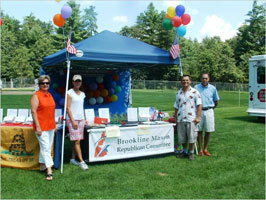 The Brookline-Mason Republican Committee shall advance the principles of conservatism and represent the concerns of the residents in the towns of Brookline and Mason. We shall work to advance the National and State GOP platforms, elect Republican candidates to local, state and national offices, promote voter participation, and educate present and future generations of these ideals. Copyright © 2017, BrooklineGOP.org, All Rights Reserved.